When laser printers became the standard for our industry somewhere in the nineteen-eighties they were very expensive. An HP LaserJet II printer, producing about 3r 4 pages per minute would usually cost over $3,000.00. Therefore an office had to think about how best to implement this new feature. Some offices chose to have a centralized printer area where all workstations printed to 1 or 2 central laser printers to save costs. Other offices decided to bite the bullet and purchase a smaller laser printer for each desktop so that the processors and closers didn’t have to break their concentration and leave what they were doing to pick up a print job. This turned out to be the most practical solution, especially as laser printers dropped in price. A new Closing Statement, and Landtech is ready! At the annual convention of the Dixie Land Title Association in New Orleans on September 12, 2014 , two employees, one from SoftPro software (owned by Fidelity National Title) and one from Ramquest software (partially owned by Old Republic National Title) gave a joint presentation on the new CFPB Closing Disclosure form due to be released in 2015. Promoting scare theories, they put forth the opinion that because the the Line numbers such as those on the current HUD form are going to disappear, and because “99.9% of all closing software depends on those Line numbers for their documents”, all merge forms would have to be re-programmed to conform to the new data set. They then continued to misinform the attendees that this supposed document conversion would be a long and possibly expensive undertaking. That must be one huge closing software group they are referring to, because Landtech, with over 4,000 customers in more than 40 states is not dependent on the HUD Line numbers and no Landtech documents have to be reprogrammed to meet the new CFPB forms, so according to these two ladies, Landtech must be in the remaining .1% percent of software developers, or, to extrapolate from that, the .1% of software developers got their programming right and 99.9% got it wrong. What of the customers of the 99.9% of software the employees refererred to, do they know that the merge documents they currently have will be unusable in a year when the CFPB form is released? Do they know that they will have to obtain new replacement documents from the software developer in less than one year from now at a considerable cost? Landtech Simplifies Abstracting and Title Production! 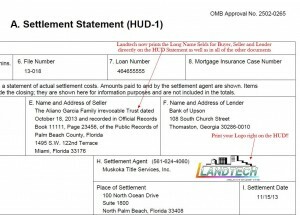 In some States like Florida, it seems that most of the title companies and real estate law firms get their searches done by a Title Underwriter and then the legal description, requirements and exceptions are imported directly from the underwriter into Landtech usually along with the Property Identification number and the names of the buyers and sellers. This obviously eliminates the need to maintain a title plant, a great expense. Some firms get the searches done by independent searchers. Landtech includes a free program, the Title Information Processor, that lets Landtech customers import title information from independent searchers. In other states, the Abstractors do the search and work-up of the title commitment and pass it to the Closing Department or Customer. Landtech has added an Abstractor section to the software that allows information to flow back and forth seamlessly between Abstractors, Processors and Closers to use the work of each other for quicker, more efficient transactions. You can now have up to 8 additional Property Addresses for multi-parcel closings. The lookup index will have the aditional addressses added so that you can look up this type of transaction by any of the Property Addresses. Landtech has also added more fields available to merge and export to reports. There are now over 10,100 Fields in each file, generated by Landtech for Abstracting, Reporting and Document Production. Anything is possible! Landtech only puts out real, meaningful improvements to the software on a regular basis, all included at no extra charge in the annual telephone support and update subscription. Use the HUD-1 pages for Commercial Transactions! The form most often used in closing transactions is the HUD-1 form, using either the pre-2009 HUD-1 or the HUD-1 for GFE transactions with the additional third page. 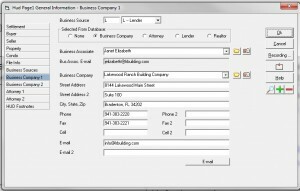 This instantly recognizable form was picked as the Landtech XML interface because everyone involved in the business end of a closing transaction knows this form and they understand how it works. This lets Landtech perform the necessary calculations, lease prorations, rent prorations and any other automated closing features to ensure accuracy and recall of file information input though the HUD-1. This also allows Landtech to instantly refresh and display the results whever you make a change. No HUD-1 Viewer necessary! There are many choices in designing software for a specific industry and the HUD-1 form selection is an important one. There were over 30 variations that were part of the choices for a HUD form that Landtech could print. Wyatt Bell picked this particular HUD form for the original Landtech for DOS because it was the form that the American Bankers’ Association picked when the HUD forms were introduced, and in common use. So, in the development of Landtech for Windows and now Landtech XML, the choice of the HUD-1 pages as an interface was a no-brainer. While it took a lot of development and programming time by the Landtech programmers, Landtech for Windows version 1.0 was introduced in 1997 as a 16 bit system with an editable HUD-1 interface. Version 2.0, the 32-bit version of Landtech for Windows, was introduced in 1998. From the HUD-1 interface, you can add, edit or examine the other parts of the transaction such as the Legal Description, Requirements or Exceptions and you can add, edit or review any conversational Notes on the file from icons on the Landtech XML toolbar. Also, directly from the HUD-1 entry pages you can also print all conveyance and title documents, disburse the file, report 1099S transactions, reconcile your trust accounts, generate a multitude of reports and many other functions. Landtech also has 80 User-defined prompts, which are fields that you can put any information you like and have it flow to your documents and reports. Some customers use these for file information such as deed and mortgage/deed of trust recording dates, books and pages so it’s part of the Landtech file and inserts itself into the proper document locations without any additional user action. The possibilities are unlimited. There is an interesting aside about using the HUD-1 as an interface that I didn’t realize until recently. An attorney who uses Landtech called me and asked about using Landtech for commercial transactions. I explained to him that if they used Landtech as an input source, then the export to any functions, particularly custom documents is automatic. It took a bit of explaining, but the actual problem was this: using the HUD-1 form as a user interface is great because of the ease of understanding and the way that you see any date or money changes instantly, but some people think that the form you are working on is the only one that you can print. That’s a very legitimate thought because many Windows programs, particularly word processors like Word and WordPerfect are like that. 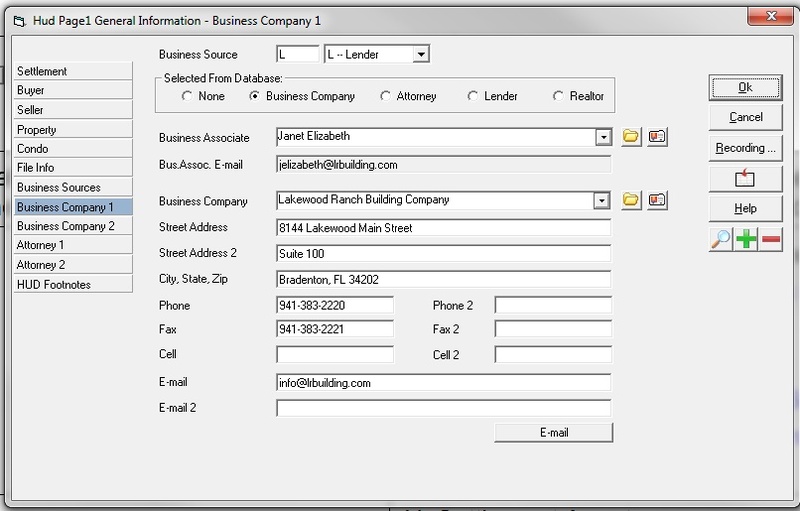 Landtech, however, lets you print any form that you want fully merged once the data is put into Landtech, so think of the on-screen HUD-1 forms as easy data entry screens. Put the information in once and only once and use that input for complete closing production for Residential or Commercial transactions. Contact us if you would like more information, please. Landtech has updated the Reports Scheduler! 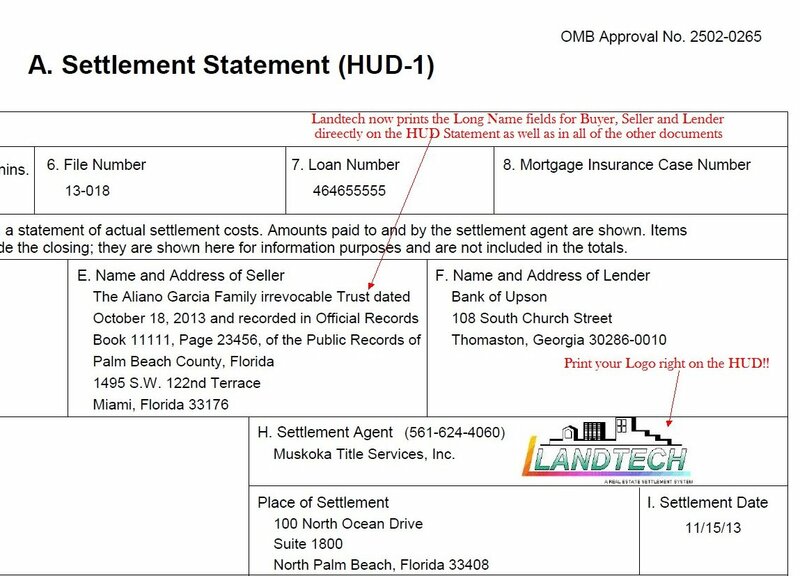 As you may know, Landtech has more than 300 variations of built-in reports such as Order Reports, Income Reports, Title Insurance Reports, Escrow Reports, 1099S Reports and many more. You can also custom-build any report from more than 8,000 variables generated by Landtech during the course of a closing. Custom-built reports can be opened using programs such as Excel or Access and the data can be massaged further in those programs. Landtech saves a list of the 20 most recent reports, built-in or custom-built, for quick and easy access. Any report can be scheduled to run at any time and the output can be directed to a printer, a PDF file, or a PDF file that is automatically attached to an outgoing email. Landtech version 2012.01.0017 now adds full scheduling functionality for the Custom Reports in addition to the existing scheduling for built-in Landtech Reports. This means that every business report that you want can be scheduled to print at off-hours, digitized as a PDF or XML file, and then emailed to interested parties. You can also set Landtech to open up Excel automatically when the report is generated. Please Contact us here for more information. These days we get our business from whatever sources we have, and it’s important to track these sources for numerous reasons. This recently added Landtech feature has made it even easier! You can now select a source from any database while you’re in the HUD Page 1 General Information dialog box without having just one database to select from. Now it’s even easier to keep an eye on who is feeding you business and, equally important, who’s not. Landtech works in the Cloud or on the Ground! New Landtech Customers can get started very quickly and inexpensively using Landtech in the Cloud. For a reasonable one time setup fee and a small monthly cost for each login name, you get a brand new fully installed Landtech with all of the documents, recording files, title and endorsement calculators, etc. That’s right, you get a complete Landtech system with every available feature for a monthly amount per month per Login name – period. There is another payment plan which many customers prefer. You can pay a small amount per closed file and if you charge the buyer and/or seller the $35.00 it can be on the Closing Statement as a legitimate charge so your Landtech costs you only the installation amount with no monthly charges to you. With this method, there is a small minimum number of monthly closed transactions depending on how many simultaneous users you have. Of course there is no charge for files that do not successfully close. Existing Landtech Customers can move their current Landtech with all of their data and documents to the Cloud for the same cost, and never pay annual telephone support and update fees again! All program updates and telephone support are included in the monthly charge. And remember, you can access your Landtech wherever you have an internet connection and a computer running any operating system. If you can get on the internet, you can access all of your Landtech data 24/7. You control your own closing files and escrow information in a secure environment. You can access it as easily as if it was on a computer in your office. The program runs as quickly as it does from your own in-office server or workstations. Landtech will make sure that you are always running the very latest version of Landtech, no more checking for updates. Landtech has the technology to make your office a virtual office quickly, smoothly and easily! For more information about this exciting Landtech feature, please click here. For several years now, Landtech has included the ability to create images of all Landtech documents and post them to a file location of your choice. If you want, Landtech will even create the destination folder for you automatically. You can also open your favorite scanning software from within Landtech to scan any received documents and add them to the scanned folder for any closing file. The features of Landtech are practically endless. Every brand of closing software uses particular terms to describe their features. We recently replaced very expensive underwriter-backed closing software for a law office and were asked about Landtech’s “Scan to file” capabilities. It took a minute to figure out the meaning of that buzzword phrase and then we realized that this has been a Landtech feature for years now, but we didn’t think to give it a proprietary name. Whatever you name it, this Landtech attribute is very attractive to users and, of course, it’s part of Landtech at no extra charge. When Landtech is installed, it is complete, and there are no optional features that have to be purchased in addition to the software. If you are using software other than Landtech, please inquire about the Landtech version of capabilities that you like in your present software, and see how we are better by utilizing true one-time entry. Please Contact us here for more information.